Photo courtesy of ASHP Archives. WHEN YOU THINK OF THE 1960s, chances are you think of the civil rights movement, the passage of the Medicare law, the women’s movement, and peace protests… all substantial forces for change. But the ‘60s were also a pivotal time in the evolution of pharmacy training. 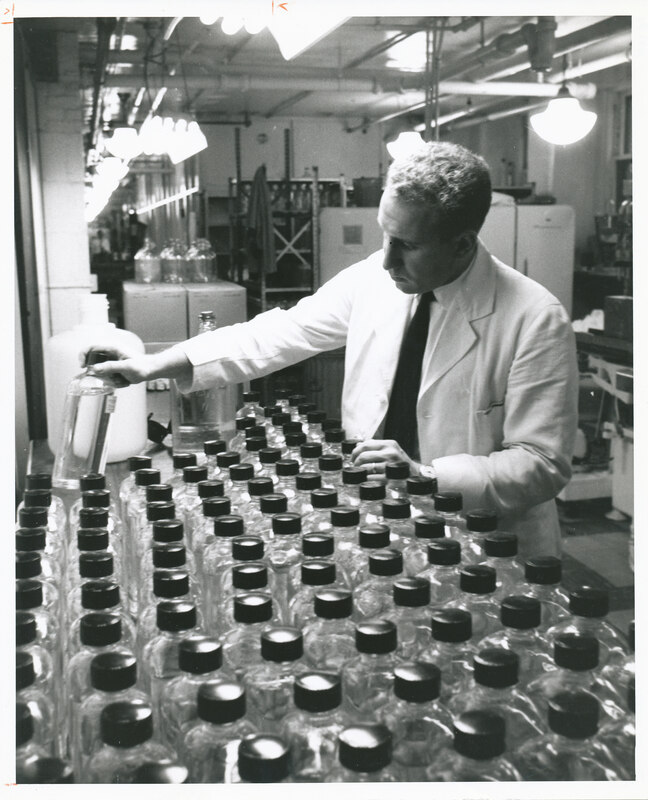 In 1962, the Board of Directors of ASHP—then the American Society of Hospital Pharmacists—adopted the ASHP Statement on Accreditation of Hospital Pharmacy Internship Training Programs, which laid out objectives for post-graduate programs that would provide in-depth training. 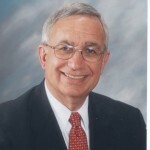 To distinguish these programs from those geared toward meeting the legal requirements for licensure, that same year ASHP dropped the term “internship” and replaced it with “residency.” In 1963, ASHP began the process of surveying the first 32 hospitals accredited for residency in hospital pharmacy. Over the last 50 years, the form and function of accredited residency programs have shifted several times. The 1980s saw residencies divided into hospital, clinical and specialty programs. This format gave way to the pharmacy practice and specialty residencies of the 1990s and early 21st century. 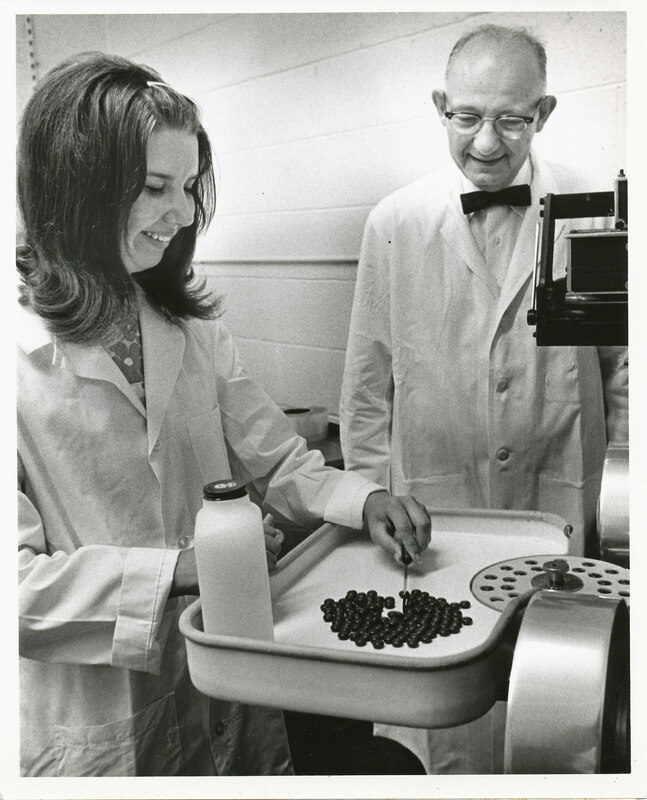 ASHP Past-President Paul G. Pierpaoli, M.S., inspects sterile solutions while a resident at the Univ. of Michigan. Photo courtesy of ASHP Archives. At the same time, ASHP created post-graduate year two (PGY2) residencies, which prepare residents for specialty pharmacy practice in areas such as ambulatory care, infectious diseases, and oncology. More than 32,000 pharmacists have completed ASHP-accredited residency programs since 1963, and the number of accredited programs has grown to 1,577. It has been a long but necessary journey, one that serves to propel pharmacists into rewarding careers and to advance the profession as a whole. 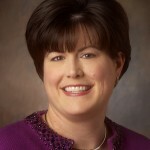 Kelly M. Smith, Pharm.D., BCPS, FASHP, FCCP, associate dean of academic and student affairs and associate professor, Department of Pharmacy Practice and Science, University of Kentucky College of Pharmacy, and a member of ASHP’s Board of Directors, added that accreditation is testimony to the atmosphere of the program in which the resident has trained. 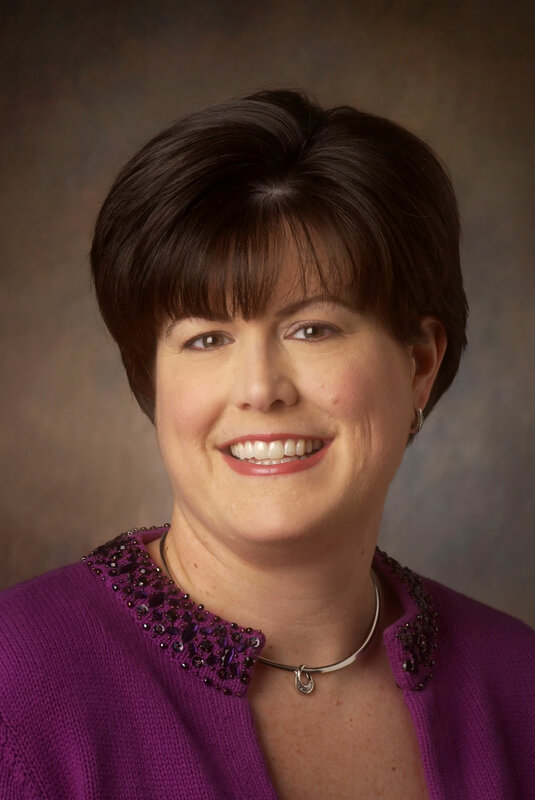 Participating in an accredited program also gives residents an edge in seeking employment, said Janet L. Teeters, M.S., ASHP’s director of accreditation services. 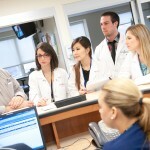 At the Department of Veterans Affairs (VA), which has 585 accredited residency positions spread across 140 programs, accreditation levels the playing field, said Lori J. Golterman, Pharm.D., national director of pharmacy residency programs and education for the VA.
“Each student has different experience because they all come from different schools, and accredited residency provides an opportunity for consistent training,” she said. For organizations seeking accreditation, the benefits start accruing long before their ASHP surveyor visit. Simply completing the preliminary RU Ready Assessment Tool for Pharmacy Residency Programs will be enlightening, said Smith. The number of residencies in ambulatory clinics and community pharmacies is growing. 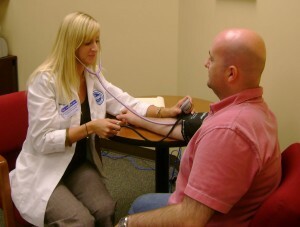 Above, Brooke Hudspeth, Pharm.D., a former PGY1 resident at the University of Kentucky College of Pharmacy, measures a patient’s blood pressure at Kroger Pharmacy, Lexington, Ky.
Brian Swift, Pharm.D., vice president and chief pharmacy officer at Thomas Jefferson University Hospital in Philadelphia, the very first site surveyed for accreditation back in 1963, agrees. “Accreditation adds credibility. 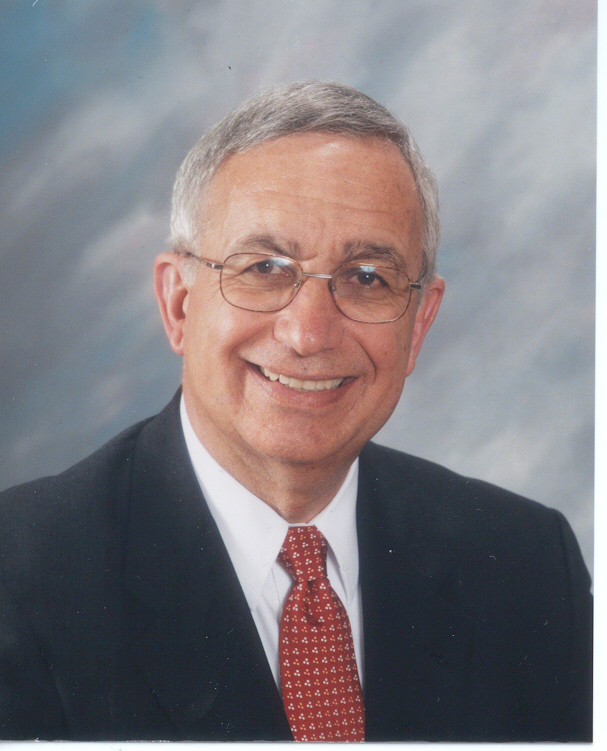 It carries an association with a large body of individuals [ASHP members] who have already traveled the path [of training and experience], and includes the organization in a legacy of outstanding practitioners and leaders in the pharmacy world,” he said. Accredited residency programs advance pharmacy within organizations and among other clinicians in the allied health professions. Indeed, preparing to apply for accreditation prompts pharmacy departments to become more cohesive and visible, said Golterman. 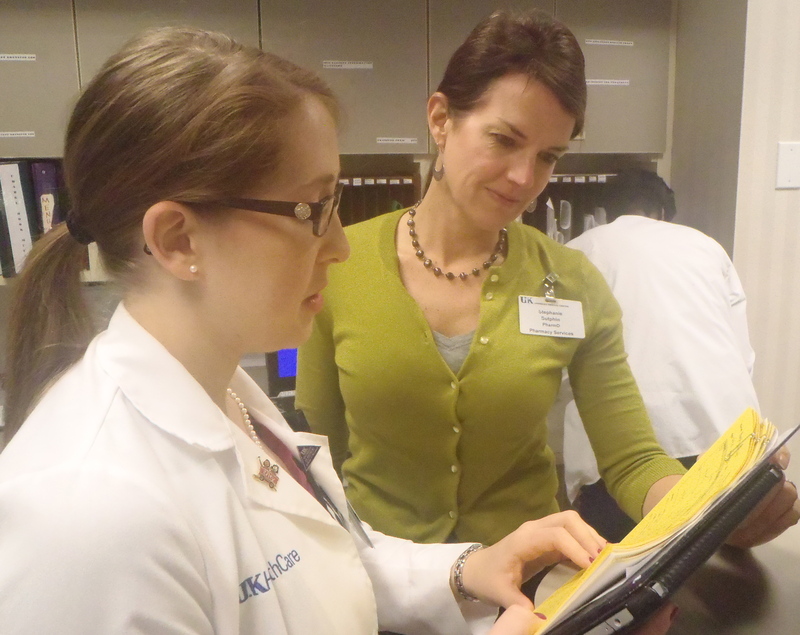 From left, Katie Long, Pharm.D., a University of Kentucky PGY2 oncology resident, consults with Stephanie Sutphin, Pharm.D., Clinical Pharmacy Specialist, Outpatient Hematology/Oncology. Because administrators must provide approval to seek accreditation, the process offers an opportunity to shine the light on the profession, said Swift. Accredited residencies also drive practice innovation, which will help expand pharmacy into additional patient-care areas and promote the inclusion of pharmacists as vital members of the care team. 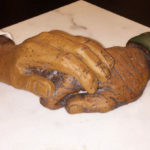 For example, at Jefferson, residents conduct research projects and marry those projects with the needs of the pharmacy department in a way that fosters organizational and practice change, said Swift. What’s Next for Accredited Residency Training? The first 50 years of residency accreditation have seen tremendous progress in post-graduate pharmacy training and education. In fact, accredited residency programs have met with so much success that there is currently a shortage of residency positions, an issue ASHP has sought to address. In 2011, ASHP and its accreditation partners hosted the Pharmacy Residency Capacity Stakeholders Conference , where participants from a variety of care settings identified ways to meet the demand for residencies. ASHP continues to seek positive partnerships such as the one it has with APhA in accrediting residencies at alternative care sites. Last year, ASHP introduced the innovative Pharmacy Online Residency Centralized Application Service , which allows residency applicants to submit and track their applications and residency program administrators to receive and organize those applications, all on one website. ASHP also created a new international accreditation standard for PGY1 residents. This fall, ASHP will host its popular National Pharmacy Preceptors Conference , August 21-23 in Washington, D.C., to continue the process of mentoring and supporting preceptors as they build quality, innovative residency programs. Finally, ASHP’s Commission on Credentialing is starting the process of revising the PGY1 standards, a process that may take a year to complete. Through various educational and outreach programs, ASHP casts its net far and wide in hopes of encouraging more hospitals, health systems, and other care settings to apply for accreditation. “We continue to advocate for additional sites and positions where health systems or hospitals have the facilities and infrastructure to provide them,” said Scheckelhoff. 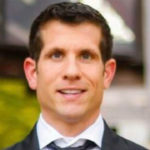 He emphasized the potential for expansion among midsize hospitals. 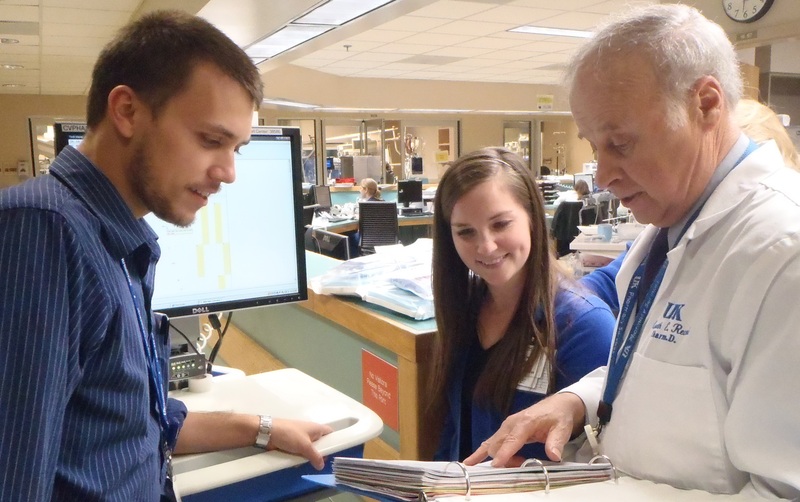 Above, from left, University of Kentucky (UK) Healthcare critical care residents Alex Flannery, Pharm.D., and Rachel Swope, Pharm.D., consult with Kenneth Record, Pharm.D., associate professor, UK College of Pharmacy, and preceptor, trauma / general surgery, UK HealthCare. Non-traditional residency programs and those in alternative care sites such as community pharmacies and ambulatory care settings are also increasing, particularly where experienced pharmacists who did not complete a residency now desire to do so, Scheckelhoff said. ASHP’s policy position is that by 2020, PGY1 residency training should be required for all pharmacists who wish to provide direct patient care services. It’s a lofty goal, one requiring a 17 percent annual growth rate in the number of PGY1 positions, according to studies cited in a 2011 commentary in the American Journal of Health-System Pharmacy. To make the accreditation more approachable and attract more programs to apply, ASHP is preparing to rewrite its pharmacy residency program accreditation standards, said Teeters. “Without decreasing quality, we’re hoping to increase capacity, mainly by making the process less onerous,” she said. Teeters added that ASHP plans to release the new standards in 2014. To learn more about ASHP’s residency program accreditation requirements and process, visit the Society’s website. Is Prescribing the Next Step in the Evolution of Pharmacy?